Catalysts are the alchemy art of chemistry... Nikko Rica has continued to specialize in hydrogenation catalysts and hydrogenation reactions ever since we were established. 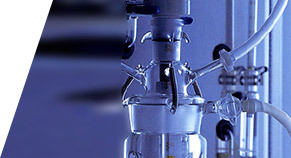 The sponge nickel catalysts of Nikko Rica that have continually advanced as scientific technology has progressed are backed up by over half a century of technological accumulation, and can respond to needs in a wide variety of fields from petrochemicals, synthetic fibers, and polymers to specialty chemical fields such as foodstuffs, pharmaceuticals, and agrochemicals. Nikko's Sponge Metal Catalysts are proud of being suitable for any of fixed-bed system, fluid-bed system or batch system. "Tailor Made Catalyst" service is available based on a joint research project with customers. We also are prepared to offer recovery and reclamation services of used catalysts, contributive to effective use of natural resources and enviromental preservation. These are the most widely used catalysts. Their performance can be altered subtly depending on their components and developing conditions. These feature in conjunction with low prices, make these catalysts ideal for fine chemicals. The Sponge nickel catalysts can be used for the hydrogenation of double and triple bonding, general organic compounds such as aldehyde, carbonyl, nitrile and nitro groups; hydrogenation of aromatic and hetero-nuclear; dehydrogenation; purification of lactum; hydrocracking; reducing amination. ※Note: In addition, sponge nickel catalysts with Fe, Cr, Mn, Mo, and other additives are also available. 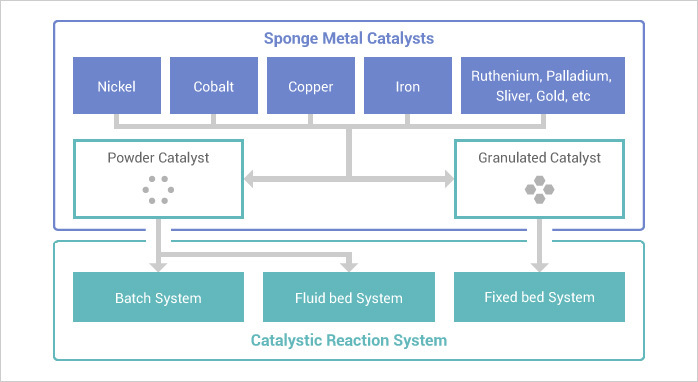 The granulated Sponge nickel catalysts are used in fixed-bed reactions which provide greater activity at low temperatures than supported catalysts (for fixed-bed reactions). Usually, customers have prepared granulated Sponge nickel catalysts by developing granulated alloys in their reactor. But now, we can supply granulated Sponge nickel catalysts by our new developing technique. These are similar to the Sponge nickel catalysts but are more stable. They are suited for hydrogenation of nitrile to amine. These can produce primary amine in a high yield by properly selecting the developing method and reaction conditions. Sponge cobalt catalyst is prepared in caustic soda solution. This is specially prepared sponge cobalt catalyst. It exhibits superior activity for hydrogenation of nitriles. These provide higher stability than the Sponge cobalt catalysts and are used for selective hydrogenation. They also give excellent performance to hydration of nitriles, hydrogenation of aldehydes, and dehydrogenation. This is sponge copper catalyst prepared as an alloy powder by conventional manufacturing methods. This is sponge copper catalyst prepared as an alloy powder manufactured using the centrifugal-spray method.Prepared by developing R-30C. Owing to a small content of fine powder, R-300C is suited to fluidbed reaction. Nikko Rica also conducts collection and recycling operations for used catalyst in order to recover resources and protect the environment. Because we are a chemicals company, we feel that it is even more important to give consideration to the environment and to act accordingly. Copyright © NIKKO RICA CORPORATION. All Rights Reserved.